With releases of Spotfire Silver (soon to to be a Spotfire Cloud), Tableau Online and attempts of a few Qlikview Partners (but not Qliktech itself yet) to the Cloud and providing their Data Visualization Platforms and Software as a Service, the Attributes, Parameters and Concerns of such VaaS or DVaaS ( Visualization as a Service) are important to understand. Below is attempt to review those “Cloud” details at least on a high level (with natural limitation of space and time applied to review). SLA – service level agreement with up-time, performance, security-related and disaster recovery metrics and certifications like SSAE16. UI and Management tools for User Privileges, Credentials and Policies. System-wide Security: SLA-enforced and monitored Physical, Network, Application, OS and Data Security. Protection or/and Encryption of all or at least sensitive (like SSN) fields/columns. multilevel backup strategy that includes disk-to-disk-to-tape data backup where tape backups serve as a secondary level of backup, not as their primary disaster recovery data source. Fail-over that cascades from server to server and from data center to data center in the event of a regional disaster, such as a hurricane or flood. 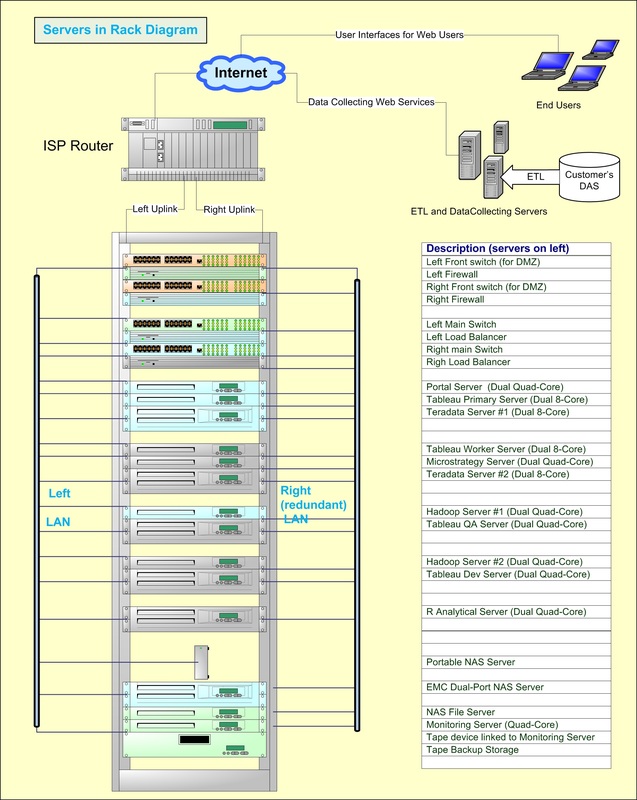 As you see above, Rack in Data Center can contain multiple Servers and other devices (like Routers and Switches, often redundant (at least 2 or sometimes N+1). Recently I designed the Hosting Data VaaS Center for Data Visualization and Business Intelligence Cloud Services and here are simplified version of it just for one Rack as a Sample.